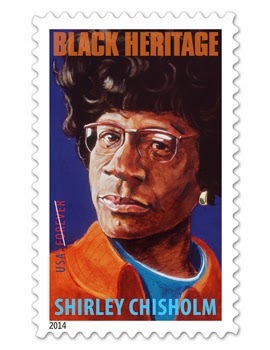 AFRICAN AMERICAN REPORTS: Shirley Chisholm stamp released by US Postal Service. Shirley Chisholm stamp released by US Postal Service. The Shirley Chisolm Stamp is the 37th stamp in the Black Heritage series features a painting of Chisholm by artist Robert Shetterly. The compelling portrait is taken from a series of paintings titled “Americans Who Tell the Truth.” Art director Ethel Kessler designed the stamp. The Shirley Chisholm stamps are being issued as Forever” stamps in self-adhesive sheets of 20. Forever stamps are always equal in value to the current First-Class Mail” one-ounce rate.